This project was elaborated as diploma thesis by Surasti Kaur Puri at Srishti School of Art, Design and Technology (Bangalore, India) in 2013. 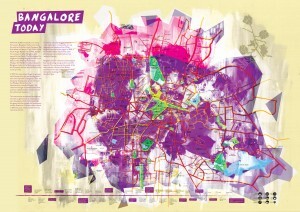 See the inspiring result of Surasti’s work below: Three different map’s of Bangalore, two of them with an alternate history, each with an attached PDF document containing a description. Have a look into the overall documentation of “Mirages of the past” as well. You’ll find some texts taken from this document below. Also, see Surasti’s Behance page for more details about the project. Every place has a past, each city a history and each one of us has born and grown up in the context of the environment we live in. With this understanding, histories of cities seem overlooked. When I travel I tend to bring back a map of whichever city I happened to visit, and after that point, after returning, that map becomes a souvenir, a tangible piece that excites my memory. 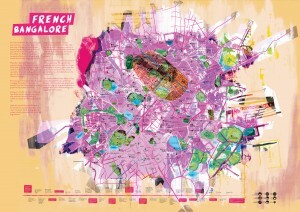 A map is something that fulfills not only function but creates a desire to discover and explore. It also is a tangible form of a city, which extends beyond regular social hierarchy, much like a phone directory, its a singular source of information that requires you to return to it time and again and caters to an audience not limited by access to technology. 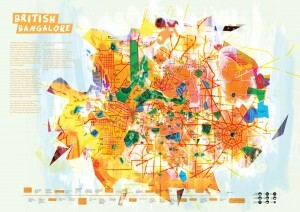 Cartography is the study and practice of making maps, combining research, technique and aesthetics, it builds a representation of a city or place to communicate information spatially. By connecting history with a cities spatial development, It allows one to get a basic understanding of that areas historical importance, transition and development over hundreds of years. A map might show you a city you know nothing about, and you wander through the city, ignoring street names and house numbers, its the experience. The purpose of the map becomes limited by its function as well, it can be used when you need and know where to go, when you need the information it might have, but how can the map be more than its labels and directions? Learn more about the project at Surasti’s Behance page.